Length : 20 to 25 minutes approx. 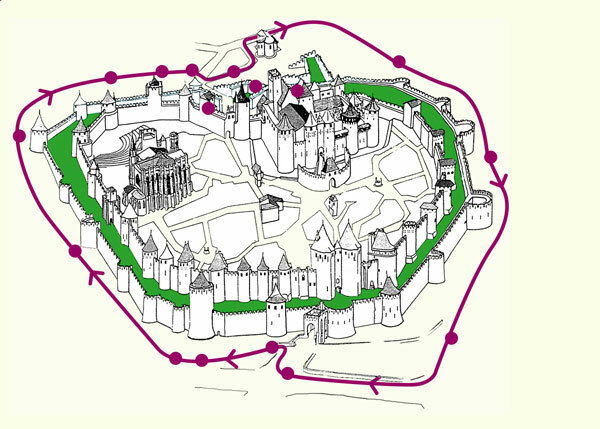 Starting from the Narbonne Gate, in front of the drawbridge, the Petit Train will take you on a tour around the UNESCO World Heritage-listed Medieval City of Carcassonne. You’ll discover it like never before, as our exclusive route will give you the most beautiful and breath-taking views of its fortified exterior! 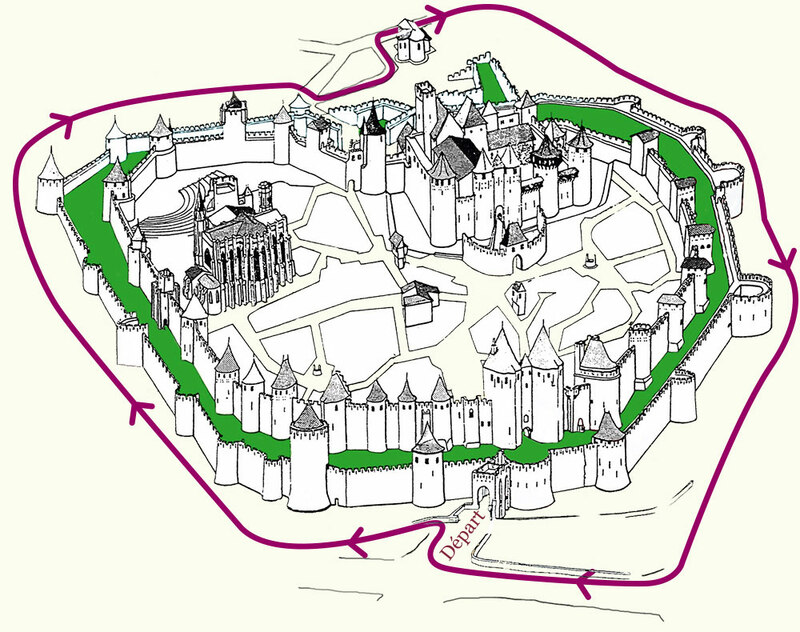 Our high quality commentary will explain to you the whole defensive system of the city, built upon the 3 kilometers of remparts: Towers, Posterns, Machicolations and many other medieval contraptions. The main attraction is the massive Western Façade, facing the Black Mountains and the Lower City. Every year, on July the 14th, it is used as the stage for a grand fireworks display celebrating Bastille Day. This grandiose rempart, on top of the hill, is the main highlight of the tour. It has been used as a backdrop in many movies. We do a short stop there to let you take pictures if you wish. During our descent of the cobblestone slope, you will see the most important parts of the Medieval City: the Aude Gate and the Inquistors’ Gallery, the Justice Tower, the Count Castle and the Grand-Châtelet, the Keep Tower and its Legend… And downhill, the Grande Caponnière behind the Saint Gimer Church. This church was built upon the ruins of the largest tower ever built in Carcassonne, the Barbacane, from wich this typical neiborhood take its name. Next up is a view on the Old Bridge, the first one built in Carcassonne, and still standing centuries later! We will then cross the most picturesque part of the lower city, the Faubourg Trivalle, that some locals dare call “Carcassonne’s Montmartre”… Maybe the charm of its small cafés, restaurants and stores will encite you to come back there once the tour is over? Eventually, the climbing Gustave Nadaud street, right below the Gallo-Roman Northern Rempart, takes us back to our deparure point. Fifty-two towers, all different, dotted along the three kilometers of remparts, makes the Cité de Carcassonne is the largest medieval fortress in Europe! After a ride in our Petit Train, you will be sure of one thing: it’s also the best one! I’ll lend you my voice!